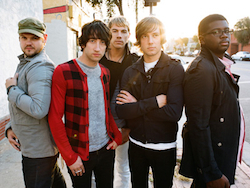 Plain White T’s started in the Chicago area in 1997 when vocalist and guitarist Tom Higgenson, who had been a drummer previously in local high school bands, decided to get out from behind the drum set and take the foreground as a front man and songwriter. After spending years developing their following in the underground scene, they exploded with their 2007 Grammy-nominated Number One single, “Hey There, Delilah.” This winter, they released their latest record, Wonders of the Younger, and have been touring on it since. They’re headlining a free music festival, The Journeys Backyard Barbecue, in Minneapolis over Memorial Day Weekend. We talked to Higgenson about the new record and the tour.